With our gardens filled with persimmons and pomegranates and Thanksgiving around the corner I was inspired to throw a few of my favorite fruits together and make a festive salad. Simple and delicious with colors that scream Fall, this salad will be a great addition to your Thanksgiving feast or a new just because treat. And don’t worry if you don’t think persimmons are your thing, give this combination a chance and you just might become a fan . I started off by slivering off round thin pieces of persimmon ( I used a mandoline) which can get tricky since some might not come out perfect, but its for taste so don’t worry. Place each sliver one by one covering each individual plate as I did or on your dish of choice if you are making a bigger salad. Take the arugula and toss with olive oil, fresh lemon juice and season to taste with salt pepper and when its ready place the greens in the middle of your dish so the persimmons are still visible. Add your red onions slices and I actually added slices of fennel as an afterthought which was great, and then top it off with sprinkles of chia and pomegranate seeds. 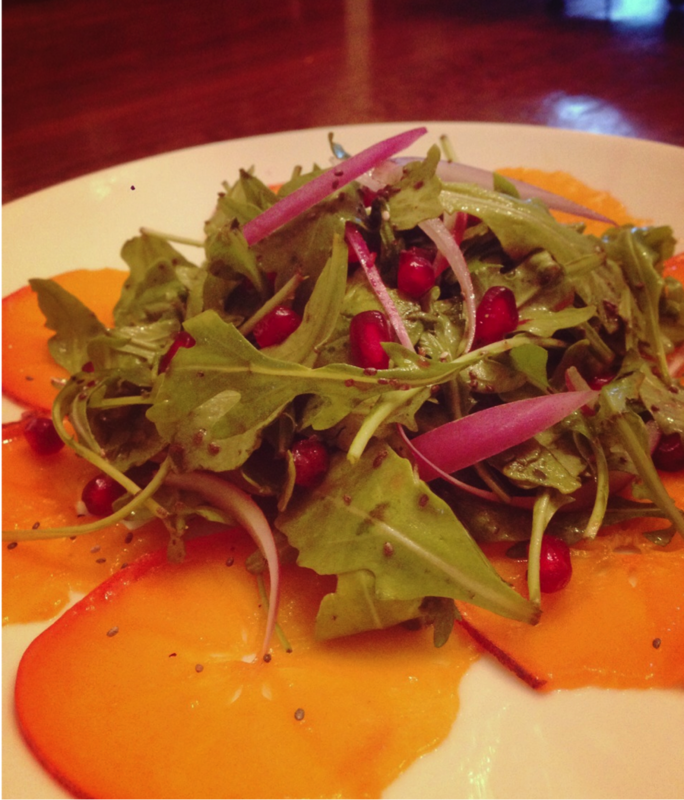 The salad is not only visually appetizing but taste amazing and fresh. Hope you enjoy!